"Street Fare: Sip, Savor, Stroll" (Formerly Mt. Airy Night Market) will dish up tasty bites and unique beverages from 45 food trucks, carts and local restaurants on Thursday, September 19, 2013, from 6:00pm -10:30pm. The evening will also feature festivities like crafts, jewelry, kids yoga, temporary Kadillac Tattoos, large screen simulcast of the Eagles vs. Kansas City Chiefs game and live entertainment, all stationed along Germantown Ave., between Sedgwick and W. Mt. Airy Avenues. 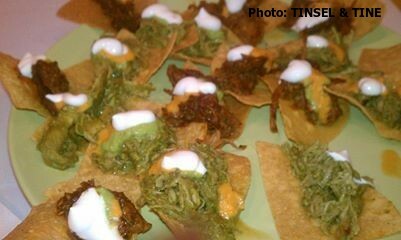 To help get the word out about this event, Tinsel & Tine was invited to a Media Preview Food Tour last week! I joined up with a group of fellow bloggers, food writers, photographers and other media peeps. As a resident of Mt. Airy, I am more than acquainted with Trolley Car Diner (7619 Germantown Ave.) It's truly one of my favorite neighborhood haunts. Upon arrival we were greeted by owner, Ken Weinstein, and some Jumbo Lump Crab Cake Sliders along with Asian Chicken Satay. As a diner lovin kinda foodie, I was devastated when the Manayunk Diner closed down recently; however, of the two, Trolley Car consistently provides meals rated *4 Tines, where Manayunk was often *2.5 - 3 Tines on most menu items. My absolute favorite thing to get at Trolley Car Diner is the golden brown, chunky white meat, savory gravy - Chicken Croquets with mashed potatoes! It's also where I shop for beer as they have over 300 varieties available dining in or taking out, the homemade donuts are a new, delicious addition, the decade old auxiliary ice cream shop out front, was made from an actual vintage Septa trolley car. After finishing our Trolley Car Strawberry Wheat Beer, Strawberry Ice Cream Floats, we mosied a little ways down Germantown Avenue to the pop up shop for Little Jimmie's Bakery and Cafe. His actual location is 6669 Germantown Ave. I have to admit, I was not familiar with Little Jimmie's, which features bakery goods like Sticky Buns with cinnamon raisins and pecans, Sweet Potato Cupcakes, Cheddar Biscuits, Rugelach, Biscotti and more. After the event, I drove home past his shop and it's adorable! I'm really looking forward to checking out Little Jimmie's reasonably priced breakfast sandwiches and Southwestern Burrito, Tacos, Taco Salads and Rice bowls. Our next stop - Avenida (7402 Germantown Ave), this restaurant features Latin American Cuisine. I have been here before for dinner and enjoyed the meal and experience, but the thing that stands out in my food memory was the Sweet Potato Upside down Cake for dessert. Avenida has a lovely outdoor patio, perfect atmosphere for sipping their popular Margaritas and Housemade Sangria, both of which we sampled. Chef and owner Kim Alvarez, treated us to Tostadas: Pulled Pork with Red Mole (variety of Mexican chilies mixed with chocolate and honey) and a Pulled Chicken with Green Mole (cilantro, tomatoes and mix of green vegetables). Our taste buds already happy, got a bit happier at our next stop - Jyoti Indian Restaurant (7220 Germantown Ave). This family run business is designed for mostly take out. We were treated to a demonstration of their Mumbai Paninis, both vegetarian and chicken cutlet versions, Kati Rolls - Fried Indian bread (Poori) rolled with chickpeas (Chana Masala) cheese (Matar Paneer) topped with lettuce, onions, cilantro and chutney. For dessert Gulab Jamun, which is sorta like bite sized pieces of bread pudding made with butter, nuts and saffron - so much better than it looks and sounds! Next Chris Simpson the owner of The Wine Thief Bistro (7152 Germantown Ave.) greeted us with Homemade Spinach Cavatelli in a brown butter with seasonal vegetables, Crispy Fried Calamari with sweet lime chili relish and Prince Edward Island Mussels in a tomato fennel and chorico broth. Accompanying this largess were Mojitos, Cosmos and a Cabernet Franc. I have been to The Wine Thief for cocktails and cheese plates, but have yet to come for dinner. The restaurant has a very appealing casually upscale, french bistro vibe. I've always imagined that as a single woman I could go and sit at The Wine Thief's pretty little bar to enjoy a meal and a glass of wine, and not feel self-conscious - one of these days I'm going to do just that. Our final stop - Earth, Bread + Brewery (7136 Germantown Ave), I have been meaning to dine here for years. Husband and wife, Tom Baker and Peggy Zwerver have a charmingly rustic Brew Pub and Pizzeria. The upstairs dining/bar area is spacious and great for groups. Their real claim to fame is Tom's talents as a brew master. From what Peggy described and from what we tasted, he's like a mad scientist constantly trying to top his last creation. Tom brews 225 gallons each batch and for the most part, introduces a new beer weekly. This summer they featured Saison's which are Belgian and French beers, naming each brew after a favorite vinyl album, for instance the Tea for Tillerman Saison is named for a Kat Stevens LP. I'm not a fan of ice tea, so this honey infused beer really wasn't to my liking, because it was almost like having a spiked glass of TAZO. The Up in Smoke Saison, was wild - like have a beer and BBQ all in one. Earth, Bread + Brewery also features wines on draft, when did wines on tap come about? Apparently, this keeps the wine from ever spoiling and leaves no carbon footprint. I enjoyed the red, made from an Albariño Spanish grapes grown in CA. And I was particularly surprised to find out their supplier is a winery close by in Fort Washington, PA. called Karamoor Estates. We only got to taste one pizza or what Earth, Bread Brewery calls flatbread. This one was made with Pine nuts, sesame seeds, pumpkin seeds, garlic and shredded mozzarella. As you can see, it's one of those bubbly, nicely crusty type brick oven pizza's. Thank you Aversa PR and Mt. Airy USA for the invitation and to all the participating restaurants. It was fun getting to know more about the good eating available in my own back yard.